Oooooooo-weeeeeee! It’s cold! Before you start scoffing and rolling your eyes (I see you, Northerners) let me explain myself. I grew up on an island, Key West to be exact, and I practically wore flip-flops year round. I have lived in Miami for the past seven years and essentially wear flip-flops year round here. I loathe the cold. It’s exciting and charming for a few days at a time, but then the fascination wears off, I miss my flip-flops and sandals, and I secretly wish to be hot and sweaty again if it meant I could be in shorts and a tank top. I often think about moving somewhere else in the country, but my aversion to cold weather really doesn’t leave me with many options! I think sunny, tropical Miami is where I’ll be for a while! The few days of cold (I use the word “cold” lightly here) weather we get in Miami allow to me get all my cool weather recipes out of my system–soups, stews and recipes that have the word “hearty” in them usually fit the bill. 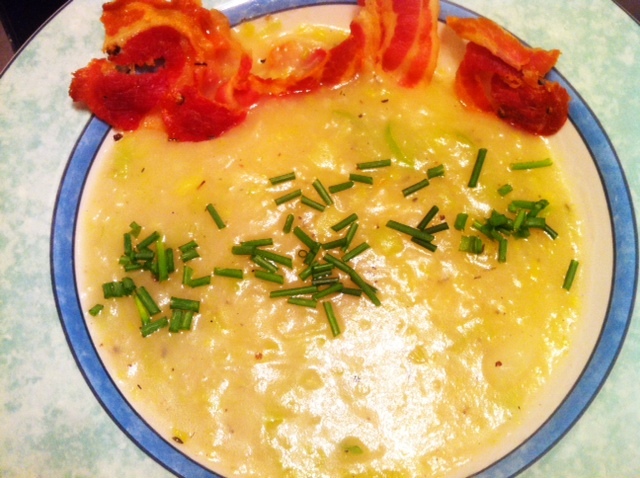 This soup is relatively healthy (minus the pancetta chips) and contains no cream at all. Could you put cream in it? Sure. I just wanted to try it without and it came out pretty darn good! An immersion blender really comes in handy here, but a regular blender will work just fine. 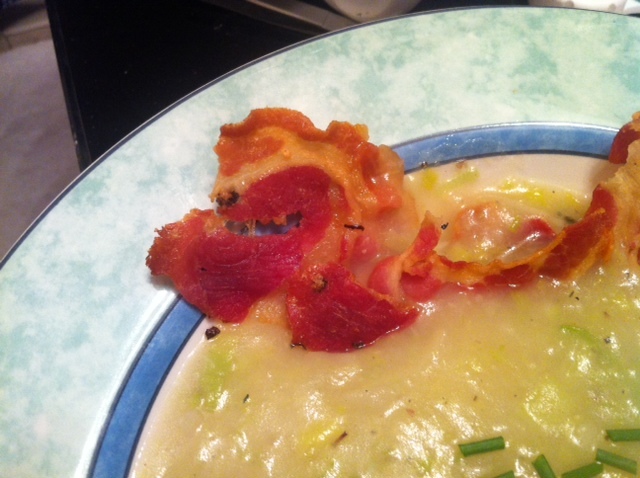 A quick note on the pancetta chips–try to find pancetta that doesn’t have a lot of fat. I realized this as I was crisping up the “chips” in my toaster oven and my house started slowly filling with smoke. Yup, that was the fat just melting away and smoking. Also, don’t buy more pancetta than you need (unless you have really good willpower). Eight slices were bought, 3 made it to my soup–you do the math. In a saucepan melt the butter over medium heat. Throw in leeks, season with salt/pepper and cover. Make sure you don’t burn the leeks. You just want to cook them gently–about 10-15 minutes. While that’s cooking, in a pot combine the potatoes, broth, and water. Bring to a boil and then let simmer for 20 minutes or so or until the potatoes are soft. 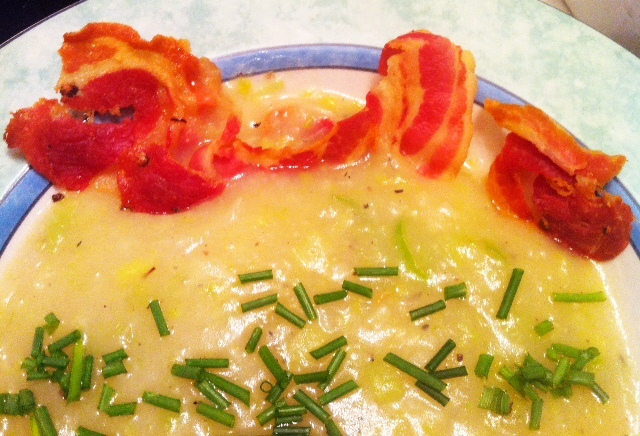 Once the leeks are done cooking and the potatoes are soft take about 3/4 of the potato mixture and puree it. I like my soup a little chunky but if you prefer it smooth then you can puree all the mixture. Add the leeks into the pot and put in the thyme. For the pancetta chips: Heat up an oven (I used my toaster oven) to 400 degrees. Place the slices on parchment paper and bake for about 3-5 minutes or until crispy. Place between two paper towels to soak up the excess grease. Plate and garnish with chives and pancetta chips!